Pigment is and I'm quoting now, 'a digital painting masterpiece' for your Joomla site. 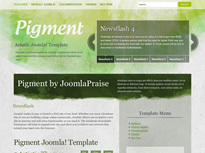 Each Pigment theme comes with an original digital painting crafted by the JoomlaPraise "artisans". What is it? Basically it is a theme but it comes with five unique themes under the hood and with each of those unique themes you get the source file so while there is a chance you might see it somewhere else, there is no excuses as to why you haven't changed it around a bit. The theme is built using the 960 grid system - as is popular these days and as is how it should be, because it just works. It also comes with 17 module positions and a one to three column layout - you get to decide.